Smallholder livestock keepers, fisherfolks and pastoralists are among the most vulnerable to climate change. 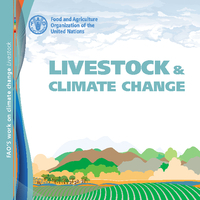 Climate change impact livestock directly (for example through heat stress and increased morbidity and mortality) and indirectly(for example through quality and availability of feed and forages, and animal diseases). At the same time, the livestock sector contributes significantly to climate change. In fact, 14.5 percent of all human-caused greenhouse gas (GHG) emissions come from livestock supply chains. It amounts to 7.1 gigatonnes (GT) of carbon dioxide equivalent (CO2-eq) per year. The objective of the summer school is to offer an updated and recent view of the ongoing trends in Climate Change research in an annual basis. The BC3 Summer School is organized in collaboration with the University of the Basque Country (Fundamentos de Análisis Económico I) and is a high quality and excellent summer course gathering leading experts in the field and students from top universities and research centres worldwide. Appearance of Maria Jose Sanz, Scientific Director of BC3, in the Commission for the Study of Climate Change of the Congress of Deputies. On November 22 at 5:00 p.m., the Scientific Director of BC3 Maria Jose Sanz, will appear at the Congress of Deputies (Commission for the Study of Climate Change) as an expert, to report on future legislative measures on climate change and energy transition. ”Noticias de Alava” publishes the participation of María José Sanz, Scientific Director of BC3, in the current IPCC report of climate change and soil. Maria José Sanz, investigadora Ikerbasque y directora científica del BC3 - Basque Center for Climate Change, ha sido seleccionada por el Grupo Intergubernamental de Expertos sobre el Cambio Climático (IPCC) como coautora (Review Editor) en el equipo que elaborará el próximo informe especial sobre Cambio climático y suelo.